German police are holding a woman suspected of manslaughter after the bodies of nine new-born babies were found buried in a garden. The 39-year-old woman is believed to be the mother of the children found in Brieskow-Finkenheerd, in Brandenburg state, near the border with Poland. Police officers with sniffer dogs were searching the site for further remains. 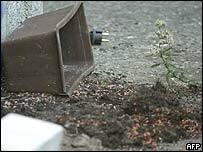 The grim discovery of little bodies found buried in flower pots and buckets has shocked Germany. It is thought that the babies were born, and died, between 1988 and 2004. "We are looking at a crime on a scale that, as far as I can remember, has never been seen in the history of the Federal Republic," Brandenburg Interior Minister Joerg Schoenbohm said in a statement. "We have to ask ourselves how this incredible crime remained hidden over all these years. It's a question directed at relatives, neighbours, doctors and the authorities." The bodies were discovered after someone clearing a garage at the site found human bones stored in a fish tank, police said. According to Reuters, the woman has said she was the mother of the babies but has not admitted killing them. A court spokesman said her statement was confused. The woman has been identified in the German press only as Sabine H. She is reported to be a jobless dental assistant who moved from the house, where her mother and eldest sister live, to nearby Frankfurt an der Oder. Bild newspaper said she met her first boyfriend, a former East German army officer and Stasi employee, when she was 17 and they had a daughter in 1984. She had two more children in the following two years. Berliner Zeitung says she has lived for several years in Frankfurt an der Oder with a man who is the father of her youngest child, 18-month-old Elisabeth. Three other children - aged 18, 19 and 20 - live with her first husband. Neighbour Ulrich Heitmann, 69, told the newspaper: "Sabine was quite a normal girl, not stupid at all". 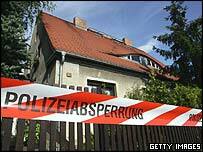 The finds come after other recent grim discoveries in Germany, says the Associated Press. Last week, a dead baby girl was found in a public toilet in Magdeburg and a young boy was discovered on a recycling company's conveyer belt in Guetersloh. A walker in Lower Saxony found a dead baby in a plastic bag in June. The authorities in Austria are holding the parents of at least three of four children whose bodies were found in a freezer and concrete-filled buckets at their home.